To control the approach speed of the LM, NASA standardised how it would fly the final part of the rendezvous - what it termed the terminal phase. Theoretical studies and Gemini experience demonstrated that the best approach was to fly this terminal phase over the time that the CSM had travelled 130 degrees of its orbit, with approach speeds set out for every stage of this arc to allow the crew to keep control of the situation. 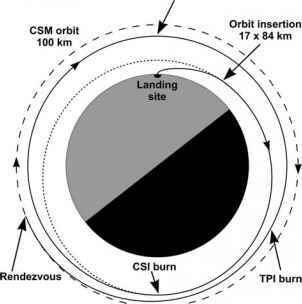 Therefore, planners could choose where in the CSM's orbit they wanted the rendezvous to occur, taking lighting into account, and then work back 130 degrees to define the point where the terminal phase ought to begin, and therefore where the LM crew would execute the terminal phase initiation (TPI) burn. One huge advantage of this 130-degree approach was that as the LM rose to meet the CSM, the latter appeared to be stationary against the background stars, allowing the crew to visually check their progress. Because of the need to be able to see the stars clearly, most of the terminal phase was arranged to occur in the Moon's shadow. Additionally, opportunities were included during the approach for course corrections, based on data from their radar. Continuing to work backwards, planners arranged for the LM to spend about 40 minutes in an orbit that was a constant 28 kilometres below the CSM's orbit. An important point to note is that this constant difference in height had to be maintained even if the CSM's orbit was elliptical. NASA used the term constant delta height (CDH) for this part of the rendezvous trajectory, and as the LM crew had to make a burn to shape their orbit to meet this condition, the manoeuvre was obviously known as the CDH burn. The purpose of this part of the flight was to give the crew time to track the CSM and calculate the burn that would be needed at TPI to complete the rendezvous. If the LM and CSM orbits leading up to the CDH burn were nearly circular and the errors were small, then it was possible to dispense with this manoeuvre. The trajectory leading up to the CDH burn was essentially a circular orbit of 84 kilometres altitude which was entered by the coelliptic sequence initiation (CSI) burn, which was made half an orbit back from where the CDH burn would occur. The only section that remains as we work backwards is the time from launch to the CSI burn. Around the time the CSM passed over the landing site, the LM ascent stage lifted off from the discarded descent stage. The ascent engine burned for about 7 minutes, ideally inserting it into an orbit with a perilune of 17 kilometres and an apolune of 84 kilometres. Half an orbit after insertion, the spacecraft had coasted to its apolune, from where the coelliptic sequence could begin with the CSI burn. • After launch, the LM entered a 17- by 84-kilometre orbit. • After half an orbit when it got to apolune, the crew made the CSI burn to circularise the orbit. They then began tracking the CSM. • After another half orbit, they made the CDH burn, if required, to reshape the orbit and have the LM fly 28 kilometres below the CSM's orbit. • During a 40-minute coast, further tracking determined the details of the burn that would take it into the terminal phase. • The TPI burn placed the LM on an intercept trajectory that was, at least for a short period, essentially a transfer orbit. It raised the orbit's apolune slightly higher than the CSM's altitude so that it would intercept its target over 130 degrees of orbital travel. Except for the initial ascent, all the burns were made with the RCS thrusters. As the LM rose to meet the CSM during the terminal phase, the crew monitored their rate of closure using the PGNS and the AGS, searching for any hint that they might be deviating from their preferred trajectory - which was a straight line in terms of inertial space (this being indicated by the fact that they held the target fixed against the stars). The CSI plan included two opportunities to make mid-course correction burns. In the final stages of approach, the commander made repeated braking burns with his RCS thrusters to bring their closing speed to zero as the LM pulled up alongside the CSM and their crewmate within, thereby never reaching the notional apolune above the orbit of the CSM. Diagram of the coelliptic sequence rendezvous technique. Years later, he told how Conrad had offered him the controls during a pass around the far side of the Moon. While out of earshot of mission control, Bean experienced how the light spacecraft, with its main tanks nearly empty, responded keenly to every impulse from the thrusters. At last, a lunar module pilot had been allowed to pilot a lunar module. The careful step-by-step methodology behind the coelliptic rendezvous took nearly two orbits to complete, but it gave the crews plenty of time to take optical and radar measurements of the angle and distance to their quarry, evaluate their progress, and calculate appropriate burns for each stage of the approach. It minimised the possibility that errors in the burns would place them on a dangerous orbit. It also permitted greater flexibility in case the CSM had to come to the LM's rescue. For this possibility, and as a backup, the CMP in the passive CSM was kept busy making his own determinations of their orbit in permanent readiness for a LM abort. The coelliptic rendezvous used for Apollos 10, 11 and 12 took nearly 4 hours to execute - a significant amount of time in a spacecraft whose total working life was measured in hours. 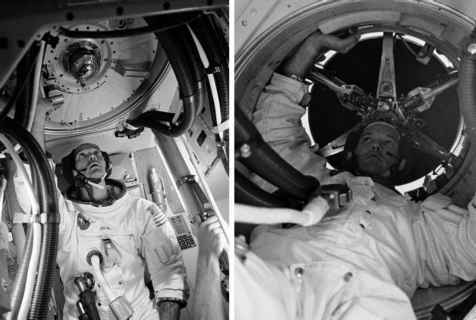 For the advanced missions that tried to fit a 6-hour moonwalk into the last surface day, the rendezvous was threatening to keep the crew from getting sleep for nearly 24 hours. During the hiatus imposed by the Apollo 13 incident, Scott and Irwin experimented in the simulators to see if they could shorten it to the benefit of their mission. The arrangement they devised, which removed an entire orbit and 2 hours from rendezvous, was implemented on Alan Shepard's Apollo 14 flight. Did csm keep it orbit permanently?